Ideal for the modern kitchen, this sleek cookware set features innovative removable handles for a space-saving, stackable design. 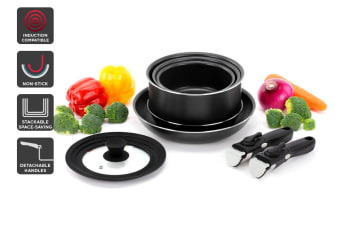 A double non-stick coating lets you cook with much less oil, for healthier meals. 2 detachable handles for easy stacking – save heaps of cupboard space! 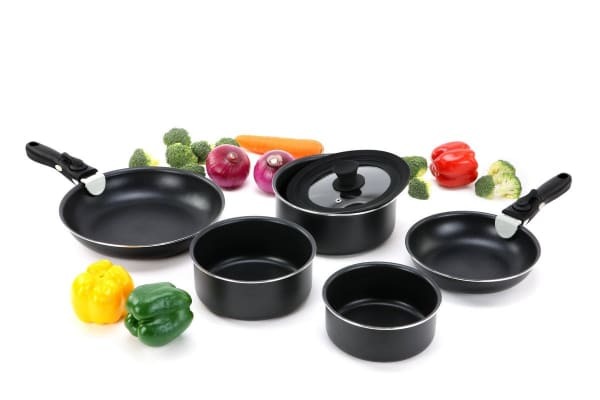 Whether you want to maximise storage in your kitchen, caravan or campsite, the Ovela Moderno 8 Piece Stackable Non-stick Cookware Set is your answer. Bake, boil, roast and fry more healthily as the non-stick coating allows you to use less butter and oil whilst still achieving the perfect flavour. It also makes cleanup a breeze – leftovers just wipe right off. The two removable handles allow the pots and pans to be stacked – economising on cupboard space, so no more fighting with doors and drawers! The handles clamp effortlessly on, and the vice-like grip remains secure no matter how heavy your pot gets. 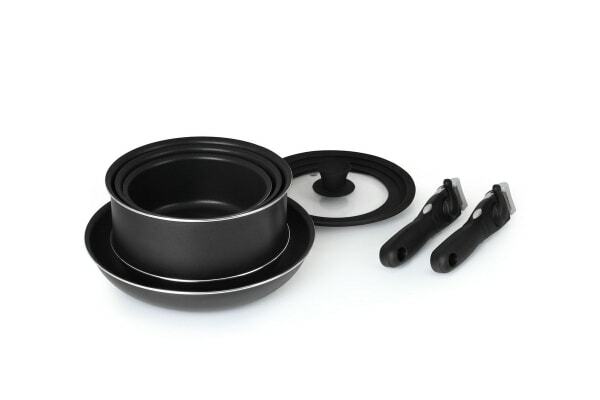 The set is suitable for all conventional cooktops, whether you cook on a gas, electric, ceramic, glass or induction stove; and can even be used in the oven – just take the handles off first.